This leaping frog wants to get across the lake, but it has to jump from lily pad to lily pad to make it there without getting wet. Use your math solving skills to answer the math problems provided and select then corresponding answer on the next row of lily pads to progress. 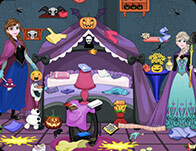 Enjoy sharpening your math skills in this online math game for kids that makes learning fun! Each level is timed, so hurry up and answer correctly to move forward. Make it all the way across the lake to complete the level and move on! Rack up a high score and see just how far you can go!